Sappington-Concord Historical Society sponsors a variety of events for its members and the public. Some are held on a regular basis and some are special one-time events. SCHS has several types of programs. The one program with a set schedule is the SCHS general meetings held quarterly in January, April, July and October. To see a list of events in the SCHS area that are sponsored by other organizations go to the page, Related Events. 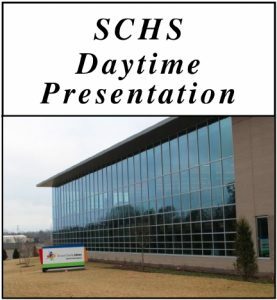 Again, the events on the Related Events page are not SCHS events, but may be of interest to SCHS members and the general public living in the Sappington-Concord area. The events are listed chronologically and by season, winter, spring and so on. Most venues for the event are noted clearly with a photo. Some events have a link to a separate page with more information about the event and related resources on the topic. Happy New Year! May it be a prosperous and happy one for you and your family. Membership dues for Sappington-Concord Historical Society are due in January. Membership fees are a reasonable $10 for an individual, $15 for a couple. In return for your investment, you get mailed to you each quarter the SCHS newsletter which is action packed with history you can relate to. That could be preserving the history of your own family and it certainly is preserving the history of our Sappington-Concord community. It is great stuff all around. Support the effort by becoming a member, volunteering and coming to the events listed below. You are also supporting the new Ross A Wagner Historical Center, the house and the farm. Pay your 2018 SCHS dues by mail, or bring them to the January 24 general meeting. Thank you for your continued support of SCHS and its mission to preserve our local history. January 18, 2018, Thursday at 2:30 pm, “The Mystique of the Victorian Lady” presented by Nancy Herndon-Ulrich of the Affton Historical Society. Why our continuous fascination with the Victorian age, especially with the Victorian lady? What is the source of her style, behavior, speech, manners, dress? How did she make her way through her day? What about the whole of her life, education, work and marriage and family? Come for insights into the Victorian lady. 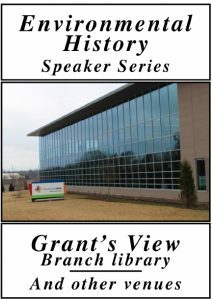 This presentation is part of the monthly 2018 history speaker series sponsored by SCHS at Friendship Village South in Sunset Hills. When you get to Friendship Village, use the friendly shuttle for your convenience. The presentations are generally held in the Rhineland Room in the Crossings building. Please check in at the front desk and get directions to the Rhineland Room. January 24, 2018, Wednesday, SCHS winter general meeting at St Lucas UCC church. Doors open at 6:30, brief business meeting at 7:00. Refreshments, then the presentation “Traveling by Steamboat on the Mississippi” by Porsche Schlapper, curator of the Herman T. Pott National Inland Waterways Library at St. Louis Mercantile Library. In this presentation, feel the romance and adventure of traveling by steamboat on the Mississippi River. Hear the tales and amazing facts about this bygone form of transportation. Feel the romance and adventure of traveling by steamboat on the Mississippi River. Boarding a steamboat in the 1800’s was truly living life in the fast lane and Porsche will give us a taste of it! Sunset Hills Community Center, “When the Blues Go Marching In: An Illustrated Timeline of St. Louis Blues Hockey” by Dan O’Neill, long-time sports columnist and feature writer at the St. Louis Post-Dispatch. Sunset Hills Community Center located behind the Sunset Hills City Hall at 3939 South Lindbergh Boulevard, St. Louis, MO 63127. Bring your hockey fan friends and your kids. Winter Meet-at-the-Site Tour to the Scott Joplin House, 2658 Delmar, St. Louis, MO 63103-1404. Parking on street, plentiful, no meters. Meet at the Joplin House at 9:45 am for a 10:00 am tour. Entrance fee = $6.00. Or drive with friends starting from St Lucas UCC. Meet near the recycling containers on the St Lucas east parking lot at 9:00, depart at 9:10 am. To share driving to the site, meet at St Lucas UCC church east parking lot at the end of the lot by the recycling containers. The gathering time at St Lucas is 9:00 am and departure is at 9:15 am. See directions to St Lucas UCC. February 10, 2018, Saturday, 10:00 am to 12:00 noon. Come tour the new building, meet Dr Simpson and some of the staff. See the commemorative plaque “Honoring the crossroads of community and commerce,” which chronicles the history of Johnny’s Market and the other businesses on the site going back to 1805. Open to the public. Free. “Forest Park; Its History and Its Beauty” by Don Corrigan and Holly Shanks. Free event open to the public. Please register at the front desk in the Crossings building. Daytime presentation at Grant’s View library “Reviving the Legacy of Annie Malone” by Linda Nance, president of the Annie Malone Historical Society. This story is one of a nearly forgotten icon of the Black Hair Care industry and focuses on the historic Poro College. Annie Malone’s incredible business acumen, generosity and outstanding philanthropic efforts gave much to the City of St. Louis, the State of Missouri and the world. The presentation will uncover interesting details about the “Poro System” and it’s impact on the economic development for people of color around the world. See directions to Grant’s View library. March 15, 2018, Thursday at 2:30 pm, SCHS at Friendship Village Sunset Hills. “The Missouri Almanac 2018-19” by Amanda Doyle. 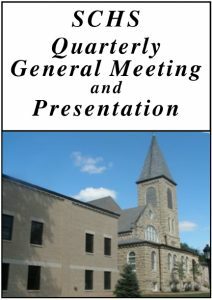 April 26, 2018, Thursday, SCHS spring general meeting at St Johns UCC church. See directions to St Johns. Doors open at 6:30 pm, brief business meeting at 7:00. Refreshments followed by presentation, Virginia Minor the re-enactment. See full agenda. The Germans in St. Louis, a genealogical research group will have an information table at the general meeting. Presentation and re-enactment by Barbara Kay who portrays Virginia Minor, the suffragette who fought for the right of women to vote. In 1872, she tried unsuccessfully to register to vote. She sued for the right and her suit went all the way to the Supreme Court, where she lost. When did women finally get the right to vote? Get the answer on the page, Virginia Minor presentation and SCHS spring general meeting. Spring Meet-at-the-Site Tour to Hawken House in Webster Groves. Charge at the door, $5.00 per person. Come, meet Noelle Wagner on Saturday, May 12, from 2:00 – 3:00 in the afternoon at the Ross A Wagner Historical Center, 9148 Sappington Road, St Louis, Missouri, 63126. Get your boarding passes early. Ken’s talk gives a 30,000 foot overview of the early airline industry from early biplanes through the DC3 and the people who created the airlines we know today, American United TWA and Delta. Retirement reception for Dr. Simpson. Come congratulate Dr Simpson on his retirement and thank him for his service to our Lindbergh Schools and the Sappington-Concord community. The reception is free and open to SCHS members and the general public. Weather rarely occupies a prominent place in the history of modern cities. This presentation will review long-term weather trends in St. Louis and explore the ways that St. Louisans have responded to a variety of weather challenges in the past, including tornadoes, storms, and heat waves over the last century. It will also report on a recent community engagement project that employs historical research to help inner-city populations plan for the impacts of climate change. The presentation will conclude with a more general assessment of how historical knowledge can enhance climate change preparedness. This presentation is part of the the speaker series, “Environmental History, St Louis and Beyond.” The series is put on by St Louis Regional Historical Societies at seven different historical societies in the area. The series is intended to bring a historical perspective to environmental problems of the past and environmental concerns of today. SCHS is hosting the session on the history of weather. The series venues highlight six other historical societies in the St Louis region which belong to St Louis Regional Historical Societies. See information about the other six talks in the speaker series at stleh.org. Meet Noelle Wagner at the Ross A Wagner Historical Center, 9148 Sappington Road, St Louis, Missouri, 63126. 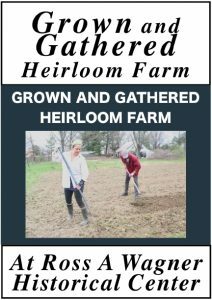 Learn about the farm, see the crops growing. Live music, art auction, light refreshments. May 31 – June 16, 2018, Tuesdays to Saturdays, 11:00 am to 2:00 pm. Visiting hours are 11:00 am to 2:00 pm. June 12, Tuesday, 12:30 to 1:00 pm in the Library of Americana and Decorative Arts on the Historic Sappington House campus. “The Dig at Sappington House” by Rachel Murphy Azzara . 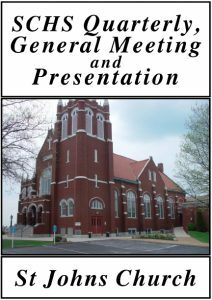 July 25, 2018, Wednesday, SCHS summer general meeting at St Lucas UCC church. Doors open at 6:30 pm, brief business meeting at 7:00. Refreshments, then the presentation by 18th century “barber surgeon” John Murphy shows his chest of tools and medical instruments. During his re-enactment, John Murphy describes and demonstrates how medical needs were taken care of in the time of the founders of our nation. See full description of the presentation and the evening of attractions at the SCHS summer quarterly meeting. Saturday, August 18 at 10:00 am. 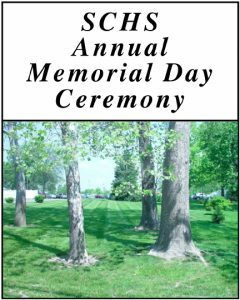 Remember the doves of peace at the annual SCHS Memorial Day ceremony? They were homing pigeons, released by Charlie Klipsch and the Mount Pleasant Pigeon Club. Visit Charlie and his pigeons on Saturday, August 18 at 10:00 am. Meet at Saint Catherine Laboure Catholic Church, 9740 Sappington Road, Saint Louis, MO 63128 in the parking lot along Sappington Road. 10:00 am. Charlie will tell us about homing and racing pigeions and give a tour of their coop. RSVP to schs.webmanager@gmail.com. Learn more about the history of your local community! 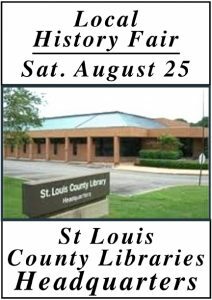 Representatives from St. Louis area local history organizations will be available to discuss their activities in documenting, preserving, and promoting the history of their communities. This is the 3rd annual fair. Visit personally or have your history organization apply to have a table. Sappington-Concord Historical Society will be there. For more information contact History & Genealogy at 314-994-3300, ext. 2070 or genealogy@slcl.org. The event is free and open to the public. Registration is not required. 11333 St. Johns Church Road 63123: Doors open at 6:30 pm, brief business meeting 7:00 to 7:20 pm. “A Review of Historic Resources in South St. Louis County” by Esley Hamilton of St. Louis County Parks. Now a board member of this society, Esley Hamilton, has looked at historic buildings in St. Louis County for over forty years. He will review highlights of buildings and cemeteries that he has researched in South County and will discuss the possible advantages of a preservation ordinance for the unincorporated parts of the county. Please note again the date and location of this meeting. Learn about the numerous gifts aviator Charles Lindbergh received after his famous transatlantic flight from New York to Paris and the subsequent flights he made in the Spirit of St. Louis. Presented by Missouri History Museum and Sharon Smith, Curator of Civic and Personal Identity. This presentation also explores the photographs and archival materials found in the Missouri Historical Society’s various Lindbergh collections. Grant’s View library Meeting Room 1. Visit the newly renovated Soldiers Memorial to see the exhibit on World War One. To share driving to the site, meet at St Lucas UCC church east parking lot at the end of the lot by the recycling containers. Time to be announced. Held at the Sappington House Library of Americana, 1015 South Sappington Road, 63126. 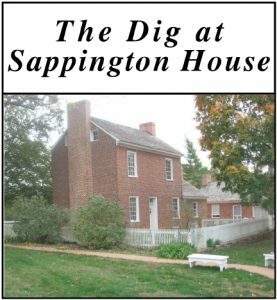 Hear the high school students from the summer 2018 archaeological dig at Sappington House report their experiences, finds and research. Artifacts found at the 2018 dig will be on display. For more information, phone Stephen at 314-918-1617. It is time to write a check for your membership dues.